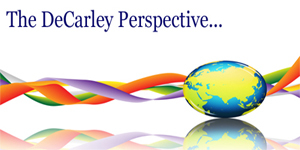 This futures market commentary was emailed to DeCarley Trading clients on May 23, 2010. In a matter of days, the equity markets went from a stage of ignorant bliss to fear of another Armageddon. Just as the bulls seem to have overpriced the good news, we believe that the bears have (at least temporarily) over-reacted to the bad news. We admit that the European debt crisis is a substantial hurdle to the recovery in the U.S. but we also believe that E.U. leaders will find a way to survive. While the aftermath might not be pleasant, we doubt that it will be enough to trigger a double-dip recession. That said, equity markets are forward looking and if there is lingering uncertainty of a turn for the worst stocks might have trouble sustaining a rally in the near-term. 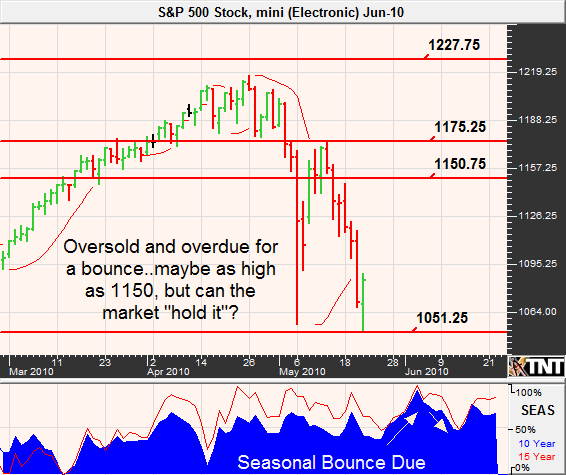 Last month we predicted that the S&P rally would stall near the 1230's before falling to levels "as low" as 1100. We now realize that 1100 was a bit conservative and we underestimated the pace at which the correction would take place. Although 1100 offered some psychological support it ultimately proved to be meaningless. The once complacent market has begun to trade defensively and this is promoting a mentality of selling all rallies. In the meantime, the VIX has moved from a two-year low back into "panic" territory. Those that stuck to the "sell in May and go away" premise, might have done very well. However, we feel as though the markets have become overextended and could be nearing a sharp bounce which could bring prices as high as 1150ish...although our first upside targets will be 1108 and then 1128. In addition, seasonal tendencies are overall weak but do suggest a temporary bounce in late May and going into June. Weekly and monthly analysis suggests that post bounce trade might result in another probing low before a larger recovery can take place. Should this occur, the first downside target would be 1014 with 980 as a possibility of things get "out of hand". 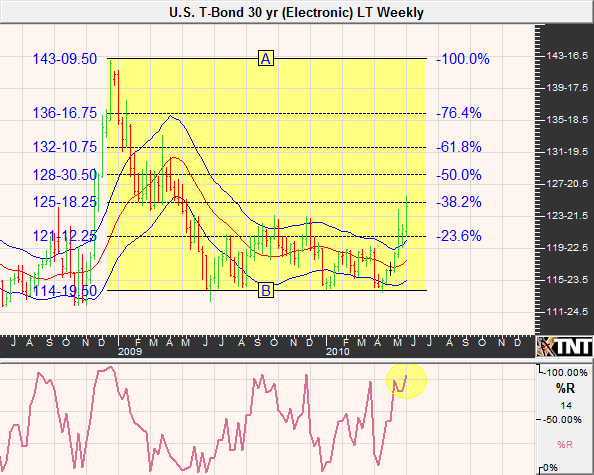 Treasury futures have spiked to levels not seen since 2009 and accordingly yields have dropped to extreme levels. It is hard to trust the rally given the fact that the last time Treasuries saw this type of pricing the S&P was below 1,000. Nonetheless, there are several fundamental wildcards that are encouraging overseas buyers into the safe haven of U.S. issued debt. The most notable buyers of U.S Treasuries seem to be those fleeing the Euro and looking for a place to put their money to work. Of the asset choices available, real estate, equities and fixed income...Treasures are clearly the safest bet. 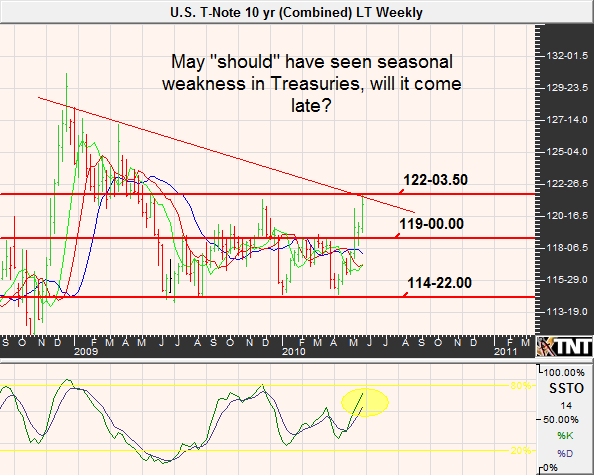 This is normally a bearish time of year for Treasuries, but this year has been a stark contrast to the norm. In the previous newsletter, we mentioned that the market "should" have a bearish tone but noted the potential price explosion that could lead bonds to the 124 mark. Unfortunately, we didn't believe the chart as much as we should have. We now know that the potential price explosion did occur and likely left many Treasury bears in compromising situations. In the meantime, look for support in the September contract near 121 and then again at 116'15. If European turmoil persists, we can't rule out a run to resistance near 126 and then again near 129. 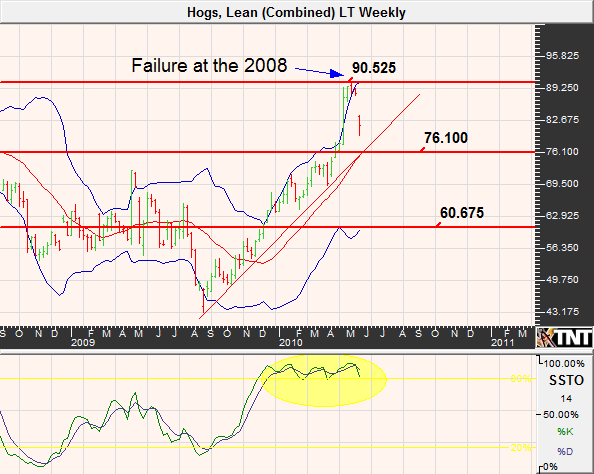 We are a little surprised that the grain complex wasn't able to capitalize on a spring rally. However, given the skyrocketing U.S. dollar and threats to the global recovery thanks to Greek debt woes, it seems reasonable that the buyers are at bay. 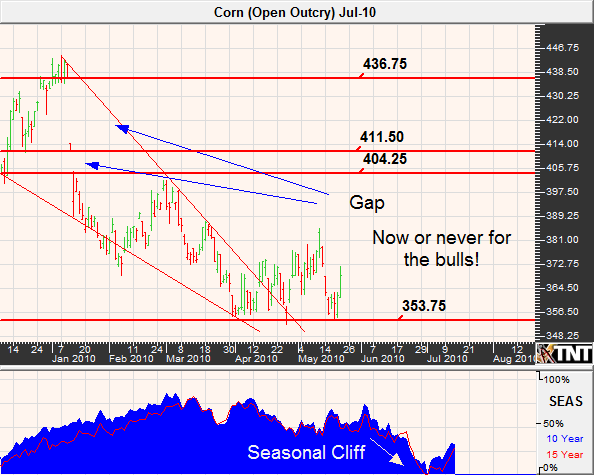 The window of opportunity for the grain bulls is quickly closing, but there might be time for the coveted seasonal rally to take place. We believe that the greenback might experience selling pressure in the near-term and this might promote temporarily higher grain prices. That said, we are approaching the June selling season in which the "money" trade in the grain complex is from the short side...at least for those with good timing. On May 11th, the USDA reported they expect the ending stocks for corn to be at 1.818 billion bushels at the end of the 2010/2011 crop year and reduced their estimate of the 2009/2010 ending stocks to 1.738 billion bushels. The new figures leaves the stocks to use ration at a relatively comfortable 14%This gives corn better prospects for a spring rally than soybeans as it appears as though the market is anticipating a near record yield in light of the near perfect growing weather. From a technical standpoint, corn futures have been eerily quiet...and you know what they say about selling a quiet market. Accordingly, we prefer to wait for much better prices to be a bear...it is possible that short covering and a last attempt by the bulls get prices above $4.00 before a larger sell-off will be possible. For much of last year, soybeans enjoyed favorable fundamentals over corn but the tides have turned. The world ending stocks for the 2010/2011 growing season are expected to be at record levels. Also working against prices is the possibility of a record yield of 45 bushels per acre. If so, the ending stocks could end up being nearly triple the supply in 2009/2010 and four times the amount the year before. However, before you get too bearish it is important to note that while the beans are in the ground and growing conditions have been optimal, there is still time for things to go wrong. It is entirely possible for corn to rally, leaving beans behind but we feel like soybean traders might bid prices up in sympathy to corn. That said, it likely won't last. The seasonal peak in soybeans tends to occur in late May or early June. 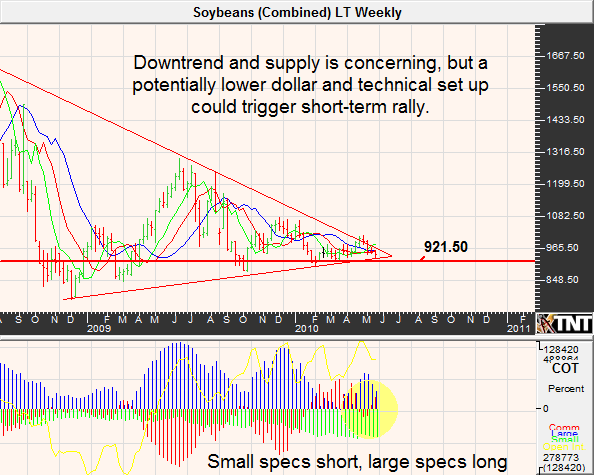 From a technical standpoint, soybeans seem to be threatening a rally from the bottom of the trading range. With most large speculators long this market, we would hate to bet against them. Instead, we like being bears from much better levels or playing the long side with small and hedged positions. If adverse weather occurs, the July contract could make a run at $10, or even a bit higher. 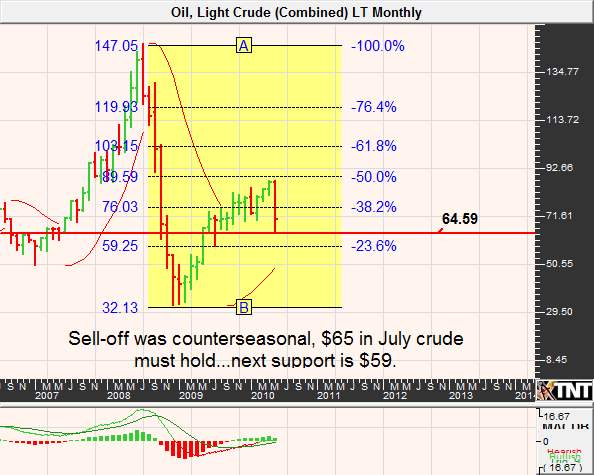 Crude oil made a counter-seasonal move that put prices at their lowest level in 10 months on concern over Europe's debt problems. Crude traders fear that the tightening of credit in Europe will lead to a contagion that stumps the global recovery and curbs demand for energy. Only time will tell whether the market has overreacted, but we tend to lean toward this premise. Despite market concerns, the DOE is predicting that world oil demand will be at 85.6 million barrels per day in 2010 and at 87.2 in 2011. OPEC came to a similar conclusion, they are looking for world oil demand in 2010 to be approximately 85.38 in 2010. According to these two unrelated agency, demand should remain relatively stable. Additionally, if the U.S. dollar goes into corrective mode there could be a floor in pricing in the mid to low $60 range. 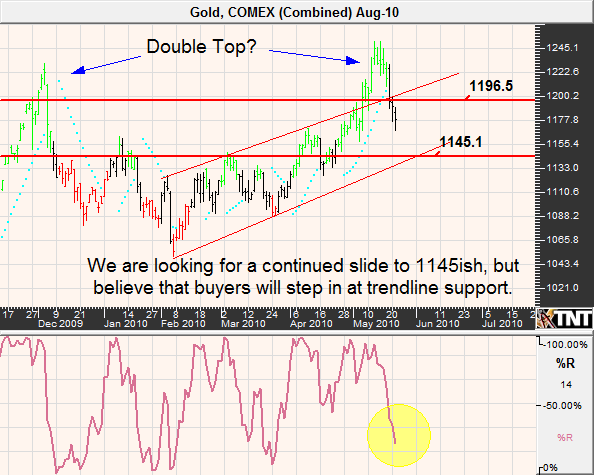 Gold typically suffers from the summer doldrums from mid-May through July. During this time, price declines are common but in a world of uncertain political and financial turmoil making money isn't as easy as selling and walking away. Supply and demand fundamentals are difficult to come by for precious metals, but traders seem to focus on more emotional reasons to buy and sell gold. Looking into the next month, we would expect prices for the metal to decline into the $1,145 range but doubt that selling will persist from there. 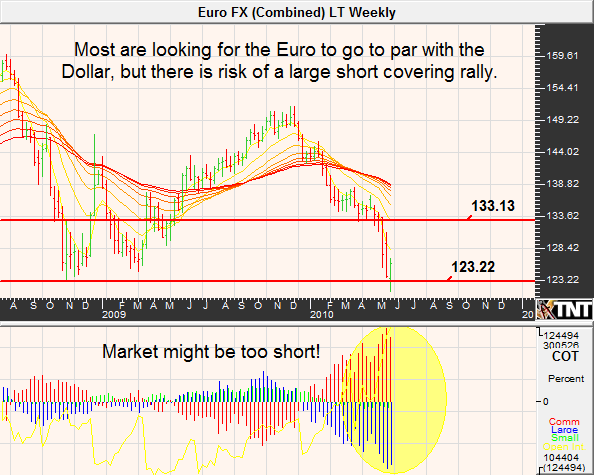 Given the mental angst in the financial markets and the fact that money fleeing the Euro will need a place to go, we have to consider the pullback a buying opportunity. What started out to be a rally in the U.S. Dollar based on the unwinding of a carry trade has turned out to be something much more. In light of the European debt debacle, the U.S. currency has once again become a favorite place for overseas investors and speculators to park cash. At this time a year ago, international super models and professional athletes were demanding to be paid in Euro rather that Dollars. However, they might be regretting that decision from a financial standpoint. Additionally, they likely aren't enjoying the high profile humility that comes with boldly denouncing the currency that ultimately came out on top. In fact, Gisele nearly signaled the top of the Euro with her refusal to accept payment in U.S. backed currency. Likewise, it wasn't that long ago that boisterous voices of concern over the dollar being a reserve currency were advocating that crude oil be priced in Euro! We can't help but continue to like the upside in the dollar from a long-term perspective but respect the fact that the Euro bear trade has become grossly overloaded. Similar to the short covering rally that catapulted the greenback in late 2009 we believe that the markets might have set up the Euro to experience the same type of upswing. This doesn't mean that we believe that the Euro will be able to sustain the gains, but we wouldn't be willing to accept much risk on a bearish Euro, or bullish Dollar, trade until it happens. In the meantime, look for the Dollar index to retreat to support near 81 and possibly even 77 if the Euro shorts are really squeezed. 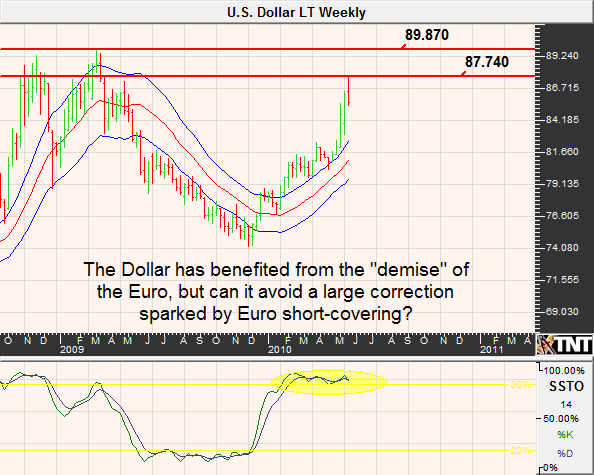 Resistance lies at 87.74 and again near 90. Similarly, the short covering rally in the Euro could extend to 1.35 (after running into a bit of resistance near 1.33) and maybe even 1.39. Last year at this time, we were talking about the tight supplies facing the sugar market and prices were beginning to take off. I doubt that few predicted the heights of the rally and it is likely that most underestimated the weakness in pricing that followed. However, as we had mentioned in this newsletter before sugar has never been able to hold dramatic price increases in the long-term. Clearly the 2008 rally proved no different. The ISO (International Sugar Organization) reported a world production surplus of 2.5 million tons in 2010/2011 in the middle of May, but Morgan Stanley had called for a production deficient of 5.4 million in 2009/2010. The 2009/2010 deficit predicted by the ISO was 8 million tons. However, this is "old" news the future of prices will rely on the next year's production and demand numbers...which seem to be much looser than the previous. Sugar might have room to fall. We can't rule out a move that puts the July contract under 10 cents. However, given the grossly oversold conditions the chart is screaming "buy". This makes playing sugar challenging and requires that all traders use risk management in their strategy. Given the size of the drop and the seasonal tendencies for higher prices, a break of resistance near 16 cents could trigger a quick move to a little over 18 cents. On the other hand, if resistance holds another round of selling could be swift. Perhaps out-of-the-money strangles such as the July 17.50 call and the 14.50 puts are the best way to play this market. As always, long option plays should be seen as "lottery tickets"...this isn't a trade that you would want to bet the farm on, but in moderation might be a wise play. Coffee prices have been range-bound thus far in 2010 but we have a feeling that we are on the brink of price restructuring in coffee. The ICO (International Coffee Organization) stated last month that "Bearing in mind the outlook for production, it is likely that demand will continue to outstrip supply in coming months". However , the ICO is in the business of promoting the coffee industry and that means keeping prices afloat. Perhaps a less biased source, Fortis Nederland, claims "World production of Arabica beans will exceed demand by almost 7 million bags in 2010/2011." We have to side with the bears but feel that it would be irresponsible to "sell" coffee near the bottom of its current trading range. We like the idea of waiting for better prices (preferably closer to $138 in the July futures contract) to be bearish. Don't forget that the summer selling frenzy in coffee is nearly upon us...but you don't want to get caught in a dramatic and temporary "weather spike". It seems as though hog traders used the EU debt crisis as an excuse to lock in profits on bullish hog speculations. Another, and likely more valid, reason for selling across the meat complex was fear of a collapse in the export market due to a surging U.S. Dollar. However, given tight supplies and the fact that the largest port importers are Mexico and Japan (unaffected by recent action in the currency markets) the selling might have been too much too fast. According to the USDA, Frozen pork in storage was down 21% from a year ago on April 30th; this was a much larger draw than expected. Conversely as of mid April, the USMEF reported that exports of the meat were up 1%. In the last DeCarley Perspective, we stated that we liked the short side of hogs near 90 cents; this time around we are taking the opposite stance. We prefer being bullish June hogs near 76ish. The latest USDA cattle on feed reports unveiled the total number of cattle and calves on feed placement were down 3.4% from a year ago. Because cattle placed in feedlots are being prepared for slaughter, the data suggests that supply down the road might be a bit tighter than some had thought. Additionally, according to the USMEF, first quarter beef exports are up 11% from a year ago. Despite positive fundamentals, the recent bout of selling has done a bit of damage to the chart and suggests that the correction might not be over. 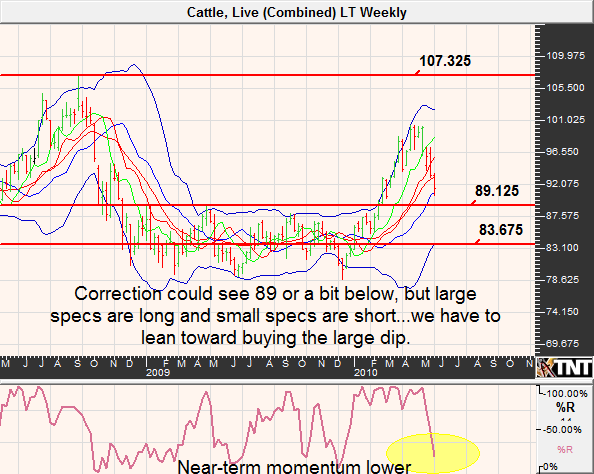 We are looking for prices to dip a bit below 89, but doubt that the selling will last in the long-term. After all, large speculators are still betting on the long side of this market. We still think that a retest of the $1.07 price range might be possible down the road.